A digital piano can be a big investment. If you aren’t sure that the hobby is going to be something you stick to, you might not want to spend a lot. In this article, we explore the 10 best digital pianos under $500. This is about as affordable as pianos get if you are going to buy first hand. If you go much cheaper than this you will likely get a product which feels more like a cheap and flimsy keyboard than actually mimicking an acoustic piano. 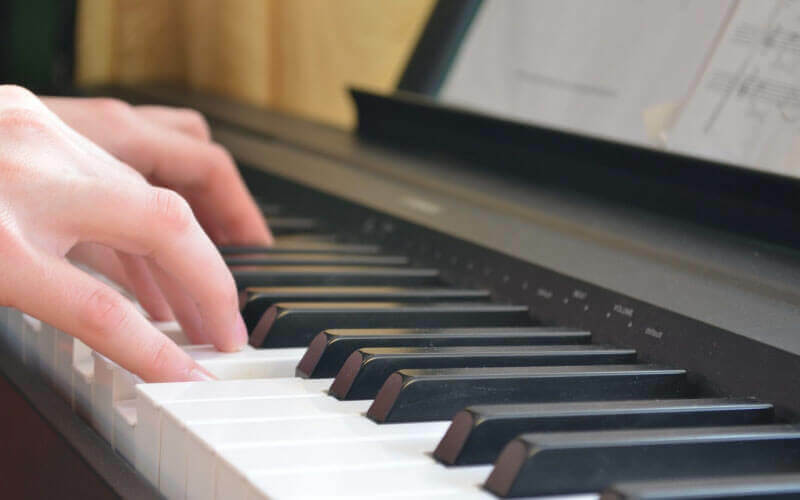 As technology has improved and the electronics market has become more competitive, there are plenty of piano manufacturers competing at this low price point, and there are some very good options for you to mull over. Here, we look at which options are best, and by going over multiple models of digital piano we allow you to pick which one might be most suitable to your own needs. No two people are looking for exactly the same thing when buying a digital piano, so we explore the variations in features and who each model might be suited to. Our first option is the best Yamaha digital piano under $500. The Yamaha P-45 is one of the most popular digital pianos available at this price range. In fact, it is one of the most popular overall. If you are looking to buy a piano which is lightweight and portable, but still has plenty of quality features and a realistic feel, this is worth looking into. It has 88-keys, which have the graded hammer action that comes with most Yamaha digital pianos and gives a good level of realism. You can even adjust how sensitive the keys are to suit your own playing style. This can be used to play any of the 10 voices which are included, sampled from real instruments in the Yamaha range. Tech features include a dual mode, which means you can play two sounds layered up. This means that you can add an extra depth to your playing. Other tech features allow you to hook this up to a computer using a USB and controlling software. Duo functionality also means that you can split this into two smaller zones, which can be great for tutoring. The fact this is so light and affordable means it is popular among stage players and to take to practice sessions. If you wish, you can then put this on a stand and use it in one place within the home so it feels like more of a permanent fixture, like an acoustic piano. We’re including this as one of the 10 best digital pianos under 500 dollars, though it is a little on the confusing side. The Yamaha P71 is an Amazon Exclusive version of the P-45 digital piano, it’s exactly the same as the P-45. All of the features and functionality is identical. We’ve included it on the list, as if you plan to buy one of these two products it is worth taking some time to look at which of the two is cheaper at the time. Artesia is a brand which is nowhere near as big as some of the other options on the list, but they have created a product which is affordable and offers some good features at a very low price. It’s easily one of the best cheap piano keyboards for around $300. This has a semi-weighted key system. It is not quite the same as the other options which have hammer action, and feels a little more like a synth or a keyboard. 3D samples have been used to create 12 different instrument sounds or ‘voices’ which can be used via this piano. The Grand Piano, the most common, is a combination of three different sounds to create a rich experience. As well as the multiple voices it also has a couple of effects which can be used. To get these inbuilt with a digital piano under $500 is rare. You can use reverb or chorus effects to impact upon the sound and further personalize. Like most modern options it has USB connectivity which means you can use the instrument to control apps and music software (DAWs). There are also headphone out options and a slot for a cable to use the sustain pedal which ships with this piano. When you hear the brand name Korg you may instantly think of iconic synthesizers and other music tech products. The truth is, they manufacture some excellent pianos too, and even at the budget end of the market, the Korg B1 can give you plenty of options as a piano as well as being used to control other software. This is another lightweight option at just around 26 lbs. This makes it one of the best portable digital pianos under $500. It includes Korg’s “NH” technology which means natural weighted hammer action. This means that the lower down the registers you go, the heavier it feels to hit the keys. This is true of acoustic pianos and this is what the Korg B1 has been based around. Along with this, MFB speakers are designed to resonate and sound like a piano’s acoustic chamber body. There are eight sounds built in, and you can instantly call back the grand piano at the push of one button with “Piano Mode”. Organ and Harpsichord sounds are also options. A metal sustain pedal comes with this piano which means more of a realistic piano playing experience. Though it doesn’t have as much of a professional feel as many of the other choices at a higher price point, it is great for less than $500 and the feel of the piano certainly has a pro feel. The first of two sibling products from Alesis, a growing brand in the world of music technology and one which creates a huge number of products for recording and playing music. The Recital is not the best sounding digital piano under $500, but it does have some decent sounds. The five which are included are acoustic and electric pianos, organ, synthesizer, and bass. It describes itself as being targeted at beginner pianists. It is a good option to learn how to play piano and many reviews have talked about the excellent price point and the fact that it includes a three month subscription to Skoove, software which can help you learn how to play even if you’re a beginner. This is one of the best 88-key digital pianos under $500, and in fact is available far cheaper than the $500 limit we’ve set. The 88 keys are semi-weighted. This is not quite the same as hammer action and feels something like a keyboard, with more of a piano weight to it. There are two different inbuilt effects, chorus and reverb. The speakers included are 20 watts and actually pretty impressive considering the price point. You can power your piano with batteries if you need to, or via mains power. This means a high level of portability. In fact, at under 16 lbs in weight it is arguably the most portable digital piano on our list. Though you’re not likely to see musicians at Glastonbury playing this, it is a good piano option for beginners and those on a budget. As promised, we’ve also included the sibling product to the above option. The Recital Pro has a lot of the same features as the Recital, but some significant upgrades. Like the Recital, this has outputs to connect to other sound systems and quality built-in speakers with a suprising amount of power at 20 watts. On top of this, there have been some improvements from the Recital. It also has the three month Skoove trial included with other Alesis products. The keys may be the most important upgrade, if you are looking for something with a realistic piano feel, the full-sized, hammer action keys can provide this. They also have a touch response which you can adjust to your own preferences. Instead of having 5 sounds like the Recital, the Pro has more than double this, with 12 in total. The keys and the sounds can be further altered with split, layer, and lesson modes which divide the keyboard in different ways suitable for lessons or layer up sounds for a rich, thick tone. Effects such as reverb, chorus and modulation are included. In spite of all the added extras of the Recital Pro, this isn’t hugely expensive and is one of the best electric pianos under $500. The Privia PX-160 only just sneaks into the $500 pricing tag, but it is undeniably the best Casio digital piano under $500 nonetheless. As well as being a top sounding digital piano it also has some very modern features and has the feel of some pianos which are far more expensive. The PX-160 uses the AiR engine which is in place for most Casio digital pianos, and is designed to recreate a brilliant grand piano sound. This is combined with a Tri-sensor hammer action keyboard, which gives very similar feel and dynamics to an acoustic piano, which is what a lot of digital pianos are aiming for. The PX-160 is one of the best weighted digital pianos in the under 500 dollar price range. As well as great piano sounds, there are string ensembles and even classic electric piano sounds. The 2 x 8W system of speakers gives a great, clear sound and decent projection, but you can easily plug into other sound systems if needed such as PA systems. Other playing modes such as duet (allowing the piano to be split into two identical playing areas for piano lessons) and layering mode and split mode to play multiple sounds either together or across the keyboard, one with your left hand and one with your right. Other great tech features include the ability to record and listen back from within the piano with no need for other software or hardware. Though not as cheap as some of the other options on this list, the Casio is definitely one of the best. The tech features combined with the fact that it has exceptional feel and connectivity make this truly one of the top rated digital pianos. A 76-key digital piano is something which is pretty rare. This is a relatively modern addition to the huge Yamaha range of digital pianos and it certainly has some cool features for those who love tech. Though this does have inbuilt sounds including a brilliantly sampled grand piano, many people love to use this as a controller for other things. The easy USB to host facilities of the Piaggero allow you to hook it up via Yamaha’s iOS ‘controller app’ and then allow you to take advantage of the growing number of apps the brand is creating. The built in speakers aren’t that powerful as it is a very small and portable model, but it is likely you will be using this to control other synth models or virtual instruments and then feeding this into a PA system. Though this doesn’t come with a sustain or damper pedal, it is compatible, and FC3A pedals can be bought with the piano. It only has 64 note polyphony so you may need to be careful if playing more complicated melodies. If one of the top priorities you have is saving space and you love tech features and the ability to hook your piano up to apps and more, this could be a viable choice for you. It is cheap and very simple to use, just keep in mind the fact that there are less keys present than some of the competitors. Roland is a brand never afraid to innovate, and this is exactly what they have tried to do with their GO:PIANO range. This is the largest in said range at 88 keys, and is exceptional if you are looking for a portable piano choice. Roland manufactures a lot of top MIDI controllers and other music tech equipment, and their forays into digital pianos are very successful, incorporating some of the things you would expect from MIDI options. They describe this as a great piano for “aspiring musicians”. The brilliant, clear piano sounds are great for playing traditional piano-based tracks, but you have the option to control much more. You can wirelessly hook up to your smartphone or tablet and use the inbuilt speakers to listen to your favorite tracks and even play along to them. The Bluetooth also allows you to control devices with MIDI 100% wirelessly, a real innovation. There are only four sounds inbuilt, an electric piano, grand piano, strings and organ sounds. This means you will probably want to use your Roland to control other sounds via a laptop or even smart device. It is totally portable and can even be powered by batteries and listened to via headphones. You could, in theory, play this anywhere and any time if you wish! It weighs 15.7 lbs which is not the lightest on our list of top rated digital pianos, but is certainly not excessively heavy. Tech features include a recorder which can capture performances and ideas you have while you’re playing, or just record your practice and listen back to it. It also has onboard effects including reverb. This is a really useful tool for learning, playing, recording and even experimenting with music and is popular in home studios and for touring musicians. 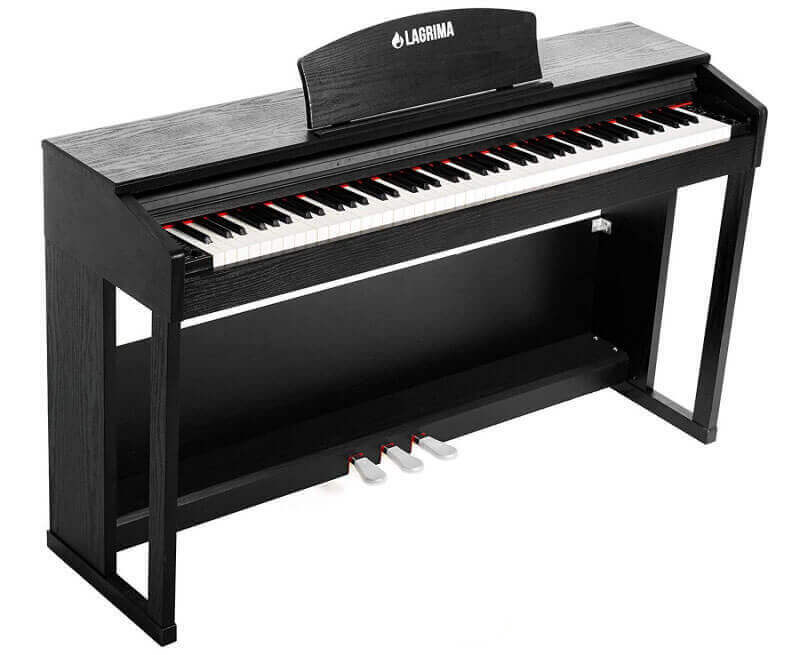 Lagrima is a manufacturer which makes a huge amount of budget pianos and keyboards with a lot of different features built in. They are very affordable for what they are and have become pretty popular among beginners and people on a budget. In fact, Lagrima is one of the only brands which has multiple options which are under $500. The LG-803 is designed to include a vast amount of options and has many of the features (such as a huge 802 inbuilt sounds) which is reminiscent of keyboards rather than digital pianos. This is one of the only products at this price point which comes with its own stand. A full three-pedal system is also included, not something that many models under $500 have. On top of this, there are a lot of different tech features. You can connect this to smartphones or other devices via USB/MIDI or via bluetooth to play MP3s. It also has 400 built-in rhythms and multiple modes including left and right-hand mode to play different sounds on each. There is a record mode to record your practices or ideas and you can even connect a microphone if you plan to sing at the same time. Digital Piano Under $500: How to Choose? The prices and models available can vary from time-to-time. Naturally, doing a little research and knowing exactly which features you should be looking for will help you to ensure you get the top piano for you. Different pianists at different musical stages will want different things from their piano, sho how can you choose the right model under $500? Most have 88 keys, but there are some digital pianos with less, including 76-key and 61-key models. If you want the full range and two-handed playing, go for 88-key models. Hammer action pianos are based on acoustic pianos and the tiny ‘hammers’ which produce the sound. Semi-weighted options feel more like keyboards or synth keys, but offer more resistance and let you alter the velocity based on how hard you hit them. Some on this list have just five, some, like the Lagrima LG-803, have hundreds! If you only think you will be playing one or two different sounds, such as grand piano and electric piano, this won’t be a priority. For loads of sounds, go for something which has at least 10 voices. Do you want a model with sustain or soft pedals included? Is it enough to buy a piano which is compatible with these pedals and add them later if you wish? Not many of the models on our list come with a stand, but you may wish to buy one separately. Check what kind of stand the piano is compatible with and whether it comes with one included. With models of top digital pianos under $500 being as low as 16 lbs in weight, there are some very small products out there with plenty of portability for you to ensure you can get it to practices. If you are just going to play at home, this won’t be a priority. If you’re looking for an option which is under $500, the chances are you are looking for good value. Some of the models offer more value than others. You can get some digital pianos and some of the best keyboards under $500 or even under $300, but don’t expect these to be as good as the models closer to $500. If you ever decide to increase your budget, then you can also check out our list of 10 best digital pianos under $1000. All the models on this list offer something a little different. Asked to choose the very best digital pianos under $500, we would recommend a couple of models. The Yamaha P-45 has brilliant connectivity, feels great to play with weighted keys and even offers good compatibility with Yamaha apps. It is available at a great price and offers a lot of portability. The Casio Privia PX-160 is another wonderful option. It is one of the most professional sounding models, especially for grand piano sounds, as it uses Casio’s AiR sampling engine. The Privia also has a wonderful weighted feel, and feels like a far more expensive digital piano when you’re playing it. Whichever product you opt for, make sure you do some research beforehand and choose the digital piano best suited to you.